5008, HUBCAP USED,14", 67, PONTIAC, TEMPEST, CHROME WITH, 12 POCKETS & BLACK INSERTS IN EVERY OTHER POCKET, RIB TYPE, RAISED CENTER,BLACK WITH RED & CHROME PMD IN CENTER, , 4 SET OF 3 METAL CLIPS. 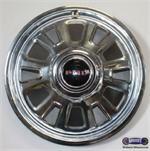 613, Hubcap, 14", 67, FORD, FAIRLANE, 12 POCKET TYPE, WITH FORD IMPRINT, EXCEPT WIRE TYPE AND MAG TYPE. 62220, Used Rims,15X6-1/2, 5 LUG, 4-1/2", 86, NISSAN, 300ZX, BRIGHT MACHINED FINISH, 12 POCKETS, ALLOY. 62220, Used Rims, 15X6-1/2, 5 LUG, 4-1/2", 86, NISSAN, 300ZX, BRIGHT MACHINED FINISH, 12 POCKETS, ALLOY.